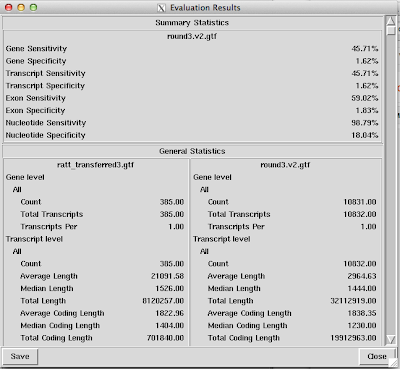 The eval program from Michael Brent's lab is very useful for getting summary statistics and accuracy statistics for a gene set. It is described in a paper in BMC Bioinformatics in 2003. The paper says that eval can be run via a GUI or the command-line. (i) It can produce histograms of a particular variable (eg. the number of exons per predicted gene), and can also categorise exons or genes by their length or GC content and shows the accuracy (eg. exon sensitivity) for each category. (ii) eval can also compare multiple gene prediction sets for a genome, for example, by building clustering of genes or exons that share some property (eg. are identical, or overlap), and then present the result as Venn diagrams. (iii) eval can also be used to select sets of genes that match another set by certain criteria, such as exact match, genomic overlap, one or more introns match, one or more exons match, start codon match, etc. The eval software and documentation are available for download from the Brent lab webpage. The current version is 2.2.8 (as of September 2013). The description of the command-line interface for eval starts on page 27 (section 2.4) of the documentation pdf. my.gtf is an eval-friendly gtf file. The script maker2eval_gtf is a script that comes with the Maker gene prediction software, for convering maker output gffs to eval-friendly gtf files. It might also work for other gff files of gene predictions (I haven't checked yet). This picks up problems with the file, such as features whose start position is after their stop position, CDS features that are after the stop codon in a transcript, transcripts with inconsistent phase values for the different CDS features, and so on. where stats is the eval output. There are lots more statistics on partial genes, single-exon genes, exons (subdivided into initial, internal, terminal, single exon genes), etc. If you have an independent set of curated genes for your species (which you think are 100% or nearly 100% correct), you can also use eval to give you specificity and sensitivity statistics for your gene prediction set. This tells us that the sensitivity is 98.8% on the nucleotide level, 59.0% on the exon level, and 45.7% on the transcript (mRNA) level. This seems to need a lot of memory when I submit it to the compute farm, I requested 2000 Mbyte. Note: [6-Oct-2015]: My colleague Diogo Ribeiro has noticed that there is a problem with Eval using a reference gene set to calculate sensitivity/specificity of a new gene set. The problem is that Eval does not take into account the scaffold/contig/chromosome where the feature is present, therefore matching CDSs/exons/transcripts/nucleotides that have the same coordinates even though on different scaffolds. Thanks Diogo for pointing this out! [Note to self: Diogo has a script thePythonEval.py that will calculate these statistics accurately. This takes a filter file, a gtf file for your annotation, a gtf file for your predictions, and then will filter the predictions according to the filter file. The eval documentation gives more information. This takes a graph file, an annotation gtf, a prediction gtf file, and makes some graphs. The eval documentation describes this further. This takes one or more sets of gtf files, and builds overlap clusters from them. See the eval documentation for more details. This will make histograms of different variables for you. See the eval documentation. Thanks to Eleanor Stanley for showing me how to use eval. "Although the GTF specification does not state that all genes in a gtf file must be from the same sequence or in the same coordinate system, this is a requirement for using the Eval software. Any GTF file used by any of the programs or lib raries described below must contain annotation of a single sequence with a ll genes in the same coordinate system (that of the sequence they annotate)." 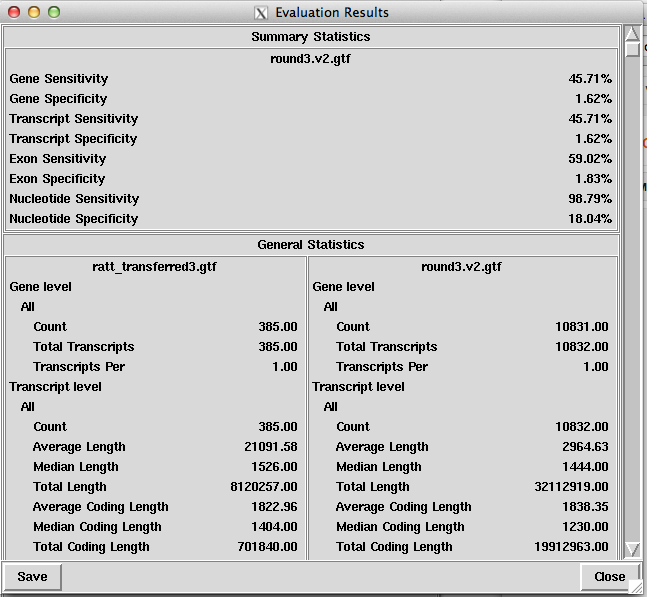 For Eval's evaluate_gtf.pl (calculating accuracy of a gene set), I think this means that we would need to make separate 'reference' and 'prediction' gtf files for each scaffold, and run evaluate_gtf.pl on each scaffold separately, then write our own script to integrate the results. For Eval's get_general_stats.pl (calculating stats such as number of exons, length of intergenic DNA), it might not such a big difference, but I remember that Eval did seem to give some strange numbers for things such as amount of intergenic DNA and this might mean that we would need to use a separate gtf file for each scaffold. Note however that Diogo's thePythonEval doesn't calculate gene level sensitivity/specificity according to the standard definition (e.g. see Burset & Guigo 1996, BursetGuigo1996_GeneEval.pdf) because thePythonEval considers a gene prediction to be a true positive if has all the exons in the true gene correct, with correct coordinates, even though the gene prediction includes extra (false positive) exons.